Matching — Dominion Technologies Group, Inc. 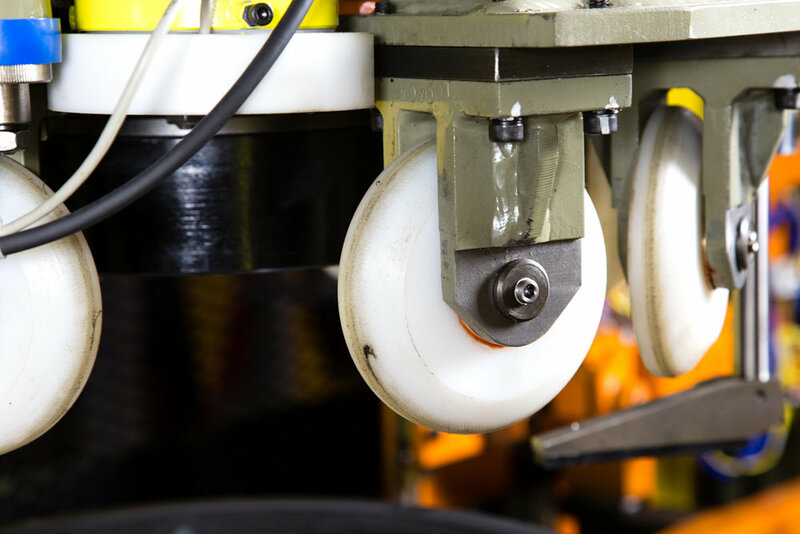 The Matcher is integral to Dominion's tire and wheel system or can be configured as a stand-alone for simple integration into our customer's process. The Matcher can be configured for two or four cameras. Four camera configurations provide an increased benefit in cycle time. The Matcher centers and optically aligns the tire and wheel assembly to improve force variation and radial run out. Tire manufacturers place a mark on the highest imbalance point of the tire. Wheel manufacturers place a mark at the lowest imbalance point of the wheel. These marks can be in the form of color paint dot or a color sticker. The Matcher, using a color vision system, aligns the marks to yield an optimal pre-balance for the assembly. The Matcher can be programmed to process aluminum, steel, or bypass mini wheels. The Matcher head can swing offline for maintenance and repair. If repairs are necessary, the lower clamp unit becomes an idle station and continues production.